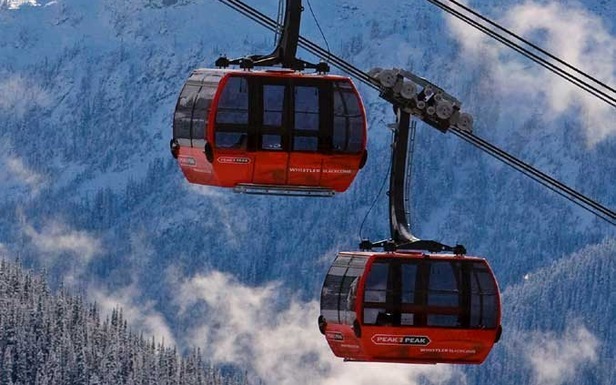 Whistler's Peak2Peak lift joins Whistler and Blackcomb Mountains. At Vail Rob Katz, Chief Executive Officer commented on the start of the season, "We are pleased with our early season, particularly given the current state of the economy and since snowfall came late to our Colorado resorts this year. Below average snowfall at our Colorado resorts leading up to the holiday season limited the amount of terrain open, which negatively impacted skier visits, including pass visits, during the early season and the beginning of the holiday season. Fortunately, recent winter storms brought significant snowfall to our resorts, which allowed us to open the vast majority of our lift serviced terrain at our five resorts. For example, Vail Mountain on December 18, 2009, had only 19 of its lifts and 28% of its terrain open, whereas Vail Mountain now has 30 lifts open and 95% of its terrain open, including all of the Back Bowls and Blue Sky Basin." Whistler has reported more fresh snow and the pattern has been repeated at many other Western Canadian resorts in resorts in Alberta and British Columbia. Whistler has a 2.35m (7.5 foot) base on the upper mountain and has received around 3cm (a foot) of new snow in the past few days. However further south Olympic venue Cypress Mountain was forced to close on Monday due to heavy rain - not a great sign with the Games three weeks away and the half pipe needing to be maintained in good shape. On the East Coast the weather has quietened down after the New Year storms with limited fresh snow in the past week. But most areas now have healthy bases and the weather has been cold enough for more snow making, so getting chance to clear access roads and prepare the pistes properly is seen as a good thing by most resorts.